To describe this as the worst crisis between France and Italy since the Second World War seems a bit of an overstatement. It’s not exactly as if troops are about to march across the Alps — as Mussolini’s did in 1940. Still, when France recalled its ambassador from Rome last week after Italy’s Deputy Prime Minister Luigi Di Maio had met a group of gilets jaunes (‘yellow vests’) protesters in central France, it felt as if European politics had taken a dangerous turn. Di Maio, a leader of the anti-establishment Five Star Movement, had tweeted a photo of the meeting with the words: “The winds of change have crossed the Alps”. No two European countries are culturally and historically closer than France and Italy. They are founding members of the European project. The two countries obsess about food and fashion alike — they are Mediterranean and of a “Latin” culture. Diplomatic practice has it that an ambassador is called back when a profound dispute or a serious hostile act has occurred requiring strong symbolic action — such as when European countries withdrew their ambassadors from Moscow after the Salisbury chemical weapon attack in the UK. So how did we reach this point? Think European parliament elections — and the rise of rightwing and leftwing populism. France’s President Emmanuel Macron, who initially cast himself as a reformist leader of the European project, has been weakened by the gilets jaunes crisis, which has been roiling since November. Now he’s struggling to cobble together an alliance of like-minded liberal democrats ahead of European elections in May. Meanwhile Italy’s strongman, Matteo Salvini, interior minister and leader of the far-right League party, has positioned himself as a flag-bearer for rightwing populists across the continent. He’s spoken of building a “League of leagues in Europe”, and recently travelled to Poland to try to forge an alliance with the ruling nationalist Law and Justice party in Warsaw. What’s at stake here is the political balance of forces within the EU. Macron has become Salvini’s favourite punchbag. Since a far-right-dominated coalition took power in Italy last year, relations with France have taken a nosedive. 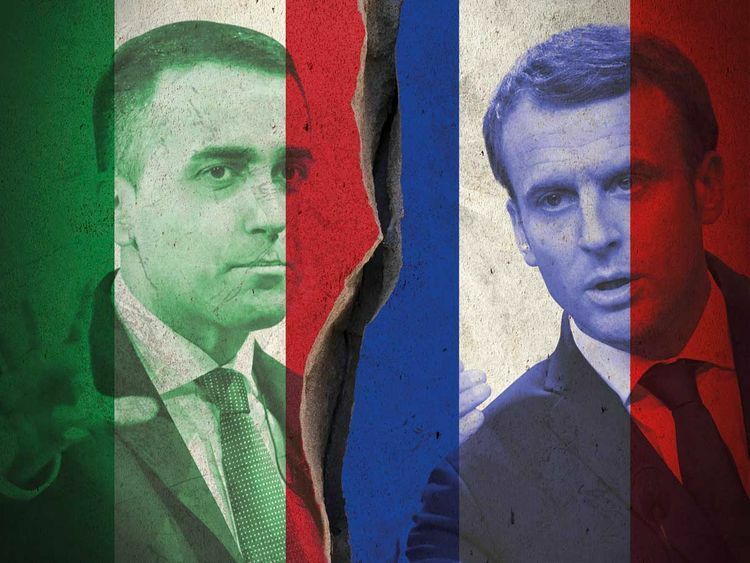 The Salvini-Di Maio duo has thrown multiple accusations at Macron, most recently on migration and France’s colonial legacy. But the last straw was Di Maio’s visit to France to meet the gilets jaunes on the outskirts of Paris. It came unannounced, and the Elysee palace sees it as a blatant gesture of support for what Macron considers not just a grassroots social protest but also an insurgency targeted both at him and at the very stability of French institutions. It was no small detail that, among the activists Di Maio met on Tuesday, stood a man who publicly called for the French president to be overthrown and replaced by a “general”. Nor has Macron forgotten how Five Star offered the French protest movement access to its digital platform to help the campaign. Salvini is also an ally of Marine Le Pen, whose National Rally party has benefited the most from the gilets jaunes crisis in opinion polls. So Macron has now put his foot down, signalling the crossing of a dangerous threshold. The French foreign ministry issued a statement denouncing “outrageous declarations” that were “without precedent since the war”. That specific historical reference was designed to be a wake-up call and a warning. It was also meant to serve as a reminder of something essential about the European project: whatever disagreements may emerge within the club, coexistence — let alone cooperation — among member states requires a minimum degree of civility and respect for the democratic legitimacy of partners. Whether this will have the intended impact in Rome remains to be seen. Salvini showed some signs of backtracking, saying he’d be happy to meet with Macron — but his tone remained defiant. The dynamics behind much of this point to domestic politics in Italy. Like all populists (whether left or right), Salvini thrives on incendiary language and on designating enemies, internal or external. So far, clashing with France and stigmatising migrants has served him well. His party’s popularity has increased in opinion polls since the 2018 Italian elections. And now the coalition partners, the far-right League and Five Star, are rivals competing for voters ahead of the European elections by using France as a scapegoat. The tactic helps distract from Italy’s woes and bad governance (the economy has entered a recession) and also from more personal inconveniences (Salvini is under investigation over his stance on migrants). With Five Star seen as the weaker partner in the coalition, its leader, Di Maio, was seeking to capitalise on the gilets jaunes — a movement he compares to the early days of his own party. This Franco-Italian diplomatic spat shouldn’t be exaggerated. It contains as much commedia dell’arte as it does sinister elements. It does not mean the EU is about to break apart. Nor does it mean the far right is set to overrun the European parliament — these forces are divided and diffuse, and polls show they won’t have a majority. But it shows — just like Brexit — how swiftly polarised domestic politics and the proliferation of hate-filled rhetoric can easily morph into acrimonious situations and open ruptures between nations that not long ago appeared to have solid partnerships and friendship. It shows the fragility of the ground we’re walking on in Europe today. Natalie Nougayrede is a Guardian columnist.